Synopsis: A group of bullied kids band together when a monster, taking the appearance of a clown, begins hunting children. In 1990, prolific horror novelist Stephen King’s most ambitious book, the simply titled It, was made into a two-part television miniseries. The book, and miniseries, was about a clown who terrorized a New England town and kidnapped its children every twenty-seven years. Now, just like in the book, IT is back, twenty-seven years later. Set in the late eighties, IT is about a group of outcast kids who jokingly call themselves the Loser’s Club and live in the town of Derry, Maine (a Stephen King staple). When the brother of Bill Denbrough (The Book of Henry‘s Jaeden Lieberher) disappears, the other Losers agree to help look for him. 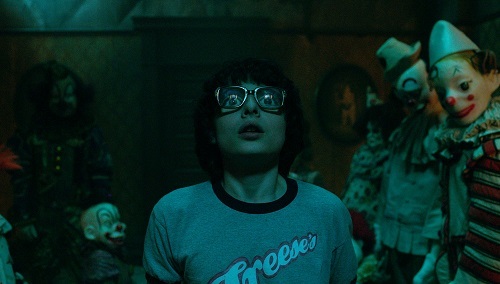 Instead of finding Bill’s little brother, though, the Loser’s Club unearths a dark secret about the town, and discovers a dark force that disguises itself as a dancing clown named Pennywise (Bill Skarsgård from Atomic Blonde) who uses their worst fears against them – and is hell bent on taking all of the kids in town. Director Andy Muschietti proved a few years back that he knew how to make a horror movie a few years back with Mama; whether it was loved or hated, everyone had to agree that it was well-made. IT is more of the same from Muschietti: more of the out-of-nowhere jump-scares, more of the dark and shadowy set pieces, more of the creepily contortionistic antagonists. IT is what Muschietti brought to the table with Mama, but shown on a much grander, Stephen King-sized scale. 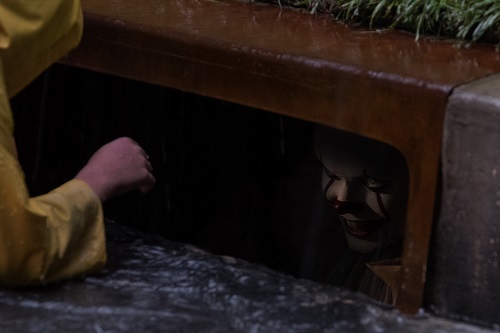 The screenplay for IT, which follows King’s book (and, therefore, the older miniseries) pretty closely, was written by Chase Palmer (his first produced feature), Gary Dauberman (Annabelle and its sequel, Annabelle: Creation), and Cary Fukunaga (Sin Nombre, “True Detective”). It essentially tells the first half of the story, the part that takes place while the principle characters are kids, but unlike the first half of the television miniseries, IT doesn’t have all of the bookended exposition adult scenes, so the movie doesn’t appear to be a flashback. 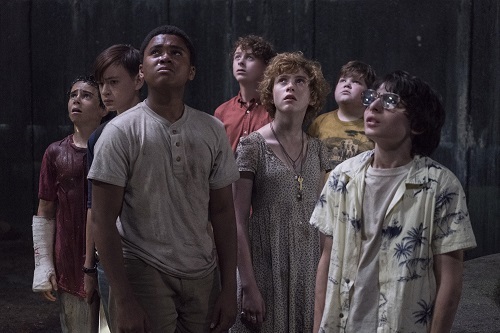 The adult versions of the kids are never shown, and it’s better that way; this is the kids’ story, and Muschietti lets them have it. There’s an Amblin vibe to IT; it’s basically a Stand By Me clone, but with a psychotic clown stalking the kids. At two-and-a-quarter hours, it would seem as if IT would drag, especially considering that there’s still half a book left for part 2. Nothing could be further from the truth. IT is a briskly-paced movie that grabs the audience with its first scene and doesn’t let go until the credits are rolling. But it’s not just scare after scare; the audience forms a bond with the Losers, so they’ve got an emotional investment in seeing them do battle with their fears. And the audience cheers at the successes, and gasps at the failures. There’s nothing groundbreaking in IT, but it’s a solid fright flick. Stephen King fans will be happy because it sticks close(ish) to the source material, especially after the gallon-in-a-shotglass treatment that The Dark Tower got. Horror fans will be happy because it’s got enough fear and fright to satisfy their midnight movie urges. And the studios will be happy because it will (probably) make a lot of money. Which is good for everyone, because there’s still a part 2 to be made. A big part of what makes IT such an effective movie is the chemistry between the kids in the Loser’s Club. Jaeden Lieberher is joined in the club by Finn Wolfhard (“Stranger Things”), Jeremy Ray Taylor (the upcoming Geostorm), Sophia Lillis (37), Jack Dylan Grazer (Tales of Halloween), Wyatt Oleff (Guardians of the Galaxy and Guardians of the Galaxy Vol. 2), and Chosen Jacobs (“Hawaii Five-0”). Separately, the kids are likeable and relatable, but together, the audience feels the intense bonds of their friendship and love, even when they’re fighting amongst each other, or when they’re all jealously competing for the affections of the only female Loser (Lillis). Although Lieberher gets most of the screen time, the cast is a true ensemble, and one gets the impression that these kids really do hang out together and ride bikes in the middle of the street in the summertime. Whether they do or not is irrelevant, because in IT, it feels as if they do. And that camaraderie is all it takes for them to get the crowd on their side. One of the biggest early controversies surrounding IT was the fact that whoever landed the role of Pennywise would have huge shoes to fill…and not just because they’re clown shoes. Tim Curry, the Pennywise from the 1990 production, has become inseparably bonded in the pop culture world with the image of the character. While he’s no Tim Curry, Bill Skarsgård holds his own, managing to be creepy as hell without cribbing too much of Curry’s style. Skarsgård has the advantage of CGI enhancement, which lets his Pennywise twist and tangle into weird shapes. The visual effects also allow Skarsgård’s Pennywise to morph right in front of the audience’s eyes, whereas Curry’s Pennywise had to rely on slick-and-quick editing tricks to do it. Both are effective in the role, but whereas Curry’s performance was purely terrifying, Sakrsgård’s is more restrained and sinister. There are also plenty of other scary things in IT, as each kid is haunted by his darkest fear. Pennywise is able to take the form of anything that scares the kids, and in this IT, it’s not just teenage werewolves and rubber spiders. Some fears are tangible, like the creepy flutist from a painting or a neighborhood leper hobo (played by legendary contortionist/nightmare actor Javier Botet from The Conjuring 2 and Crimson Peak). Some are a bit more abstract, traditional psychological phobias that Pennywise is able to exploit. All of the fears are more believable, though. That’s where this IT definitely has one up on its predecessor. IT is not pants-poopingly scary. The scares that it does have, however, are genuine. There’s nothing cheap about them.